Tuesday Treats: Quilt as you go hexagons. I have had a number of requests for instructions to quilt -as -you -go hexagons so here they are! You can apply theses instructions to any size hexagon you wish to make. You need backing fabric, a contrasting feature fabric (or fabrics), fusible wadding (or non-fusible wadding and basting spray), and thread to match your backing fabric (Aurifil of course!!). Scraps of fabric and wadding are ideal. 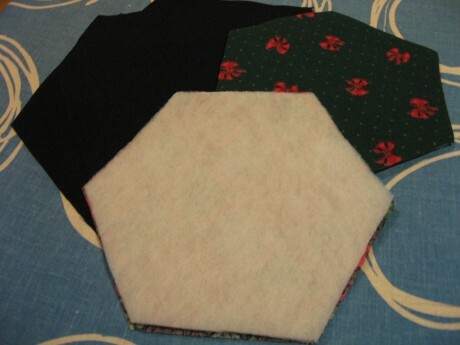 Mark and cut smaller hexagons from your featured fabric and your larger hexagons from your backing fabric. For each hexagon, you also need to mark and cut small hexagons from fusible wadding and fuse onto the back of the feature fabric hexagons. Ironing fusible wadding to small hexagons. I like to use a quilting ruler and mark 3/4” from the edge on the top side of the backing hexagon. 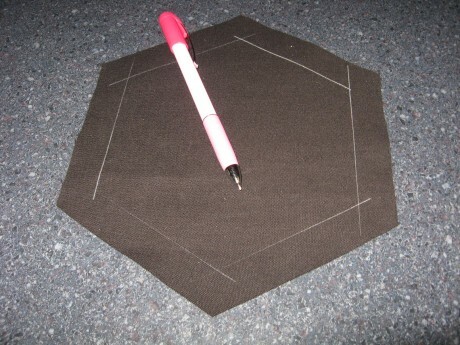 This helps me to centre the small hexagon and have even seam allowances. Marking the position of the small hexagon. Place the small hexagon and the large hexagon together, wrong sides together with the fused wadding between, making sure that the small hexagon is centred. Finger press a 1/4” seam towards the centre, all around the edge of the large hexagon , then fold over and pin in place. 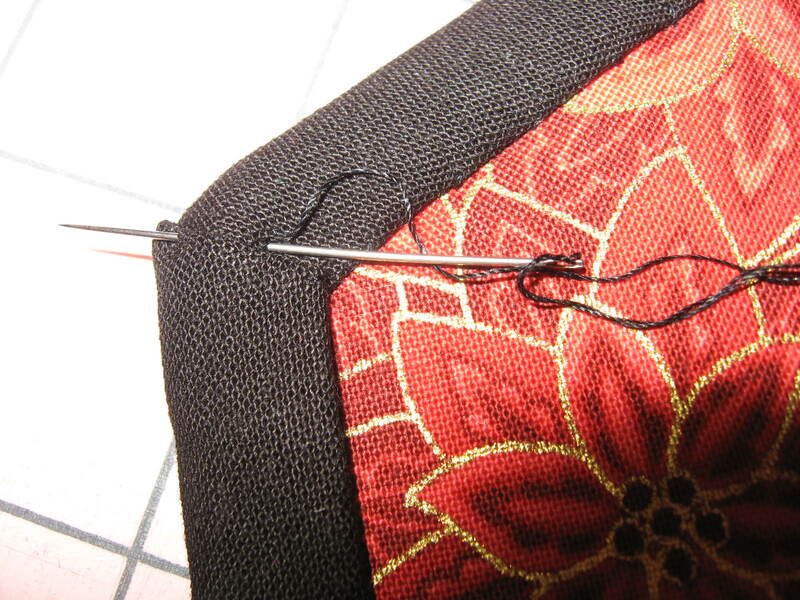 Be careful to make neat corners – I like to ensure my corner seams all face in one direction (either clockwise or anti-clockwise). 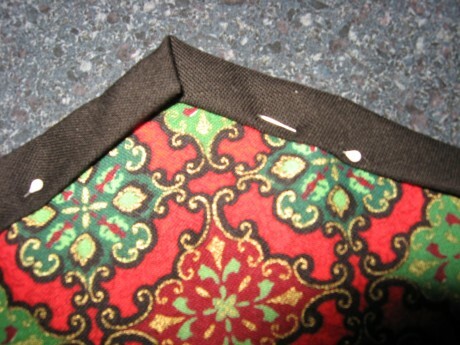 Now sew all the seams in place from the front. 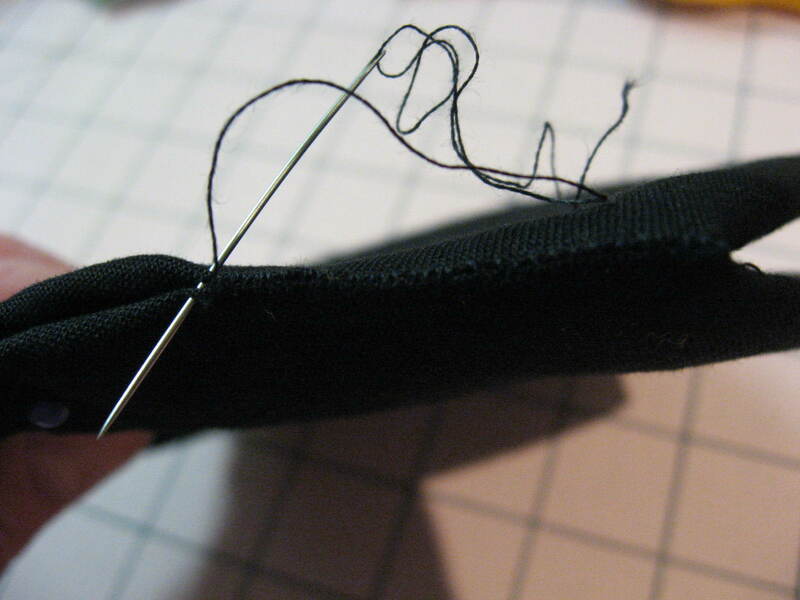 To do this I use the same stitch I use to sew down quilt bindings, making sure to add a couple of stitches into each corner to secure. I use Aurifil Cotton Mako 40 for this task. Make as many hexagons as you require in this way. To join them together, place two hexagons right sides facing, making sure corners are exactly matched and whip stitch together using very small stitches and trying to take only a small “bite” into each hexagon. Small stitches and small bites mean that you have a very neat appearance on the right side, with your stitches hardly visible! This is all you need to do to make your quilt or item, but there are additional embellishments for those who are keen!! You can add a row of quilting around the edge as I have done in the photo, or indeed quilt an appropriately sized motif in the centre. My thread of choice here is Aurifil Cotton Mako 12. Quilting stitch around the edge. 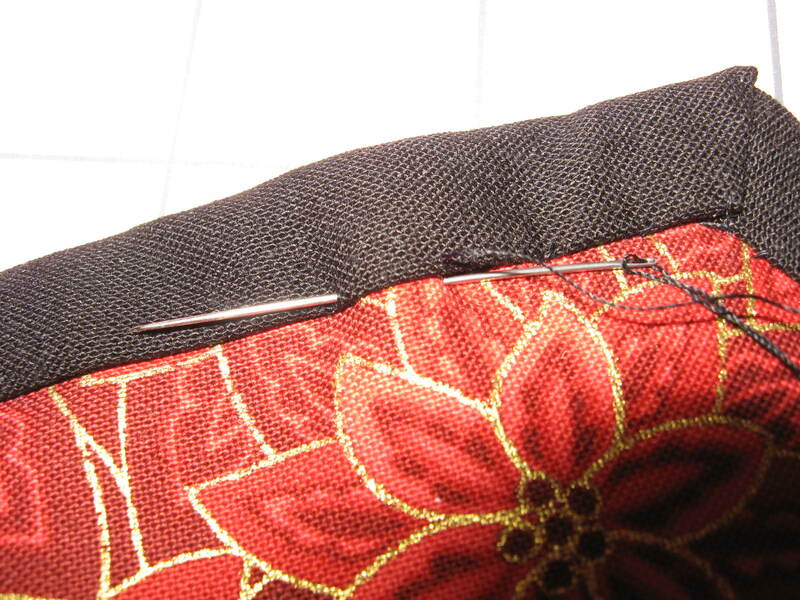 You can also embroider along the joins if you wish. When joining hexagons together to make a quilt you can leave the edges as they are or make half-hexagons to fill in the spaces. In the scrappy quilt in the photo I have left the edges as they are. 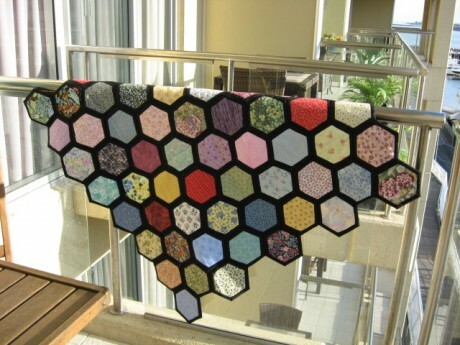 There are many other possibilities for quilt as you go hexagons. 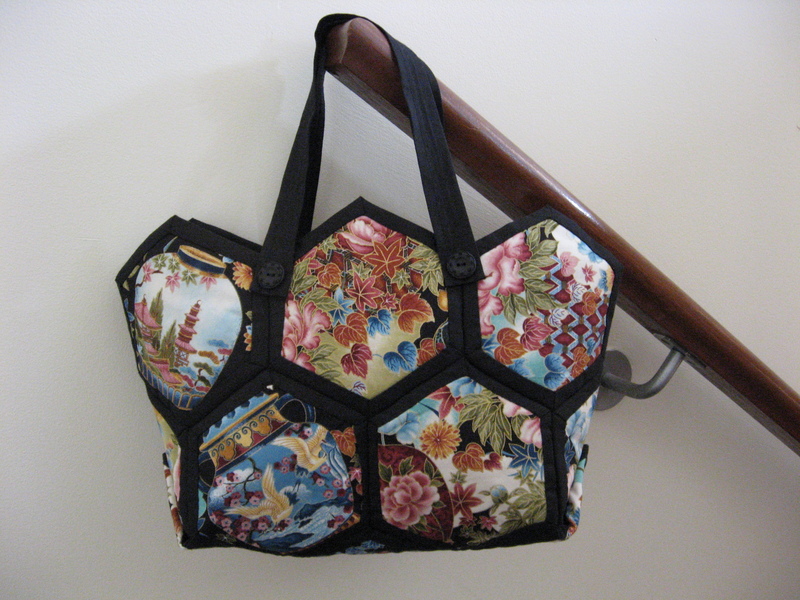 I have made a couple of hexagon bags using a Patchwork with Busyfingers pattern. 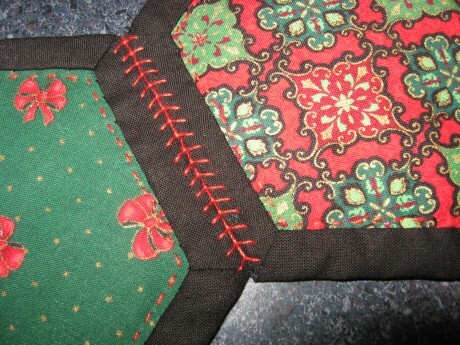 A friend is making small quilt as you go hexagons into mug bags. If you haven’t tried this technique have a go! It’s a great way to use your scraps of fabric and batting. This entry was posted in Aurifil, Cotton Mako', Cotton Mako' Ne 12, Cotton Mako' Ne 40, English Paper Piecing, Hexagons, Home page, Patchwork, Quilting, Tuesday Treats and tagged Aurifil, bags, Cotton Mako 40, Cotton Mako', Cotton Mako' Ne 12, Fabric Dyeing, Hexagon, Patchwork, scraps, Tuesday Treats. Bookmark the permalink. ← A Modern Quilt-Month 5/Come Fly With Me….. I have seen a quilt done with this technique last year, but wasn’t sure how to go about it. Thank you for sharing! Hope you are able to give this technique a try! You could make a funky bra,too! Good idea, but I’m not offering to model it! anyone tried this with sewing machine ? 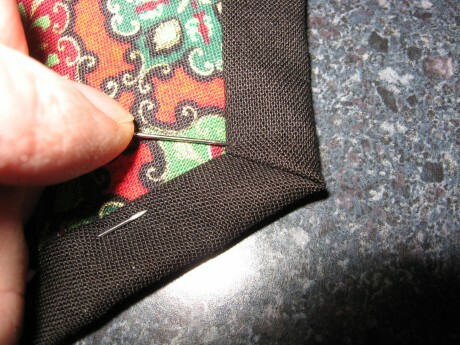 I prefer to handsew, but I’m sure this could be done by machine too. 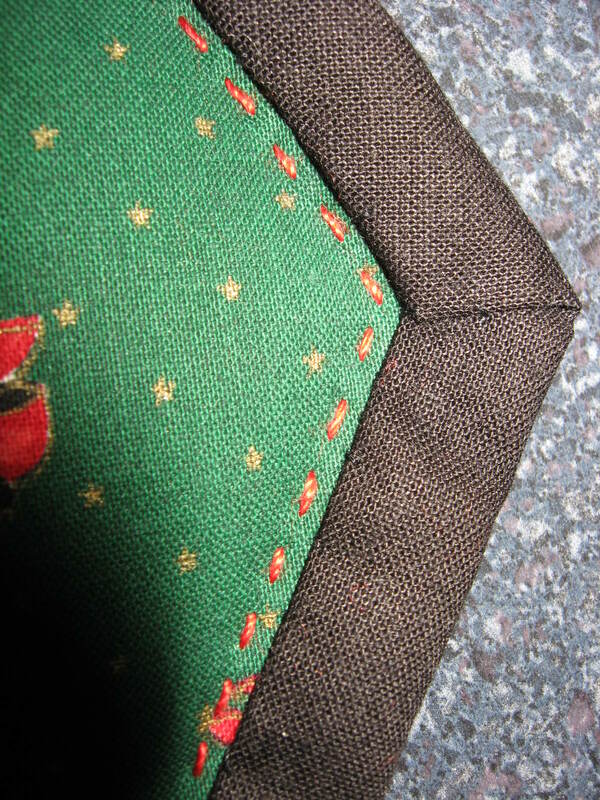 Utilitarian or decorative stitches could be used. Thank you for your comments. It’s always nice to share ideas that work well. I really love this tutorial! The possibilities are endless and now I have to try! Thank you! We’d love to hear how you get on. this quilt is beautiful. what size hexie did you start with. Definitly making one of these. I am a hexie lover. 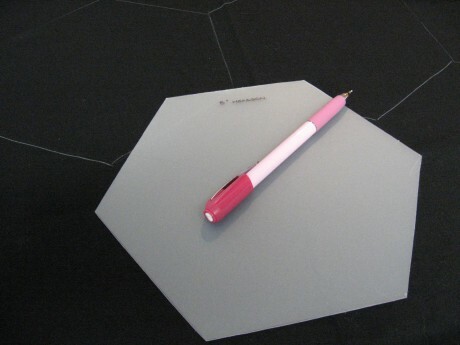 The large hexagon has a side measurement of 4″ and the smaller one is 3″. Good luck with yours. Thank you, glad you like it! Thank you, great tutorial and I love this scrappy quilt of yours. Thank you! It’s certainly a good way to use up small pieces in the stash! It is a great idea. thank you. Thank you for your comment, I hope you found it useful. Thank you. There was a bit of playing with various fabrics to get the colour selection right! What a great tutorial thank you. I have pinned this to refer back to as I wanted to make some hexagon pot holders. Thank you for this lovely feedback. I’m so glad you found it useful. The world hopes for even more passionate writers like you who aren’t afraid to mention how they believe. Yes, I am passionate about my projects! Thank you for your comments. I have learned so much from this tutorial….so much up-to-date ideas …..thanks for it all! I’m very glad you found it helpful! I am looking forward to trying this technique, it makes me excited about trying something new. thank you so much for sharing this with us. I am so excited to start one. waiting for some fabric squares in the mail and then I am good to go……..